(1) Many people today still want to know what the deal is with this whole rocker thing, and whether they ought to consider a rockered ski. (2) I still rarely hear the case made that rockered skis are more than just fashionable or fun, that they are potentially more safe. So take a look, and let us know what you think. 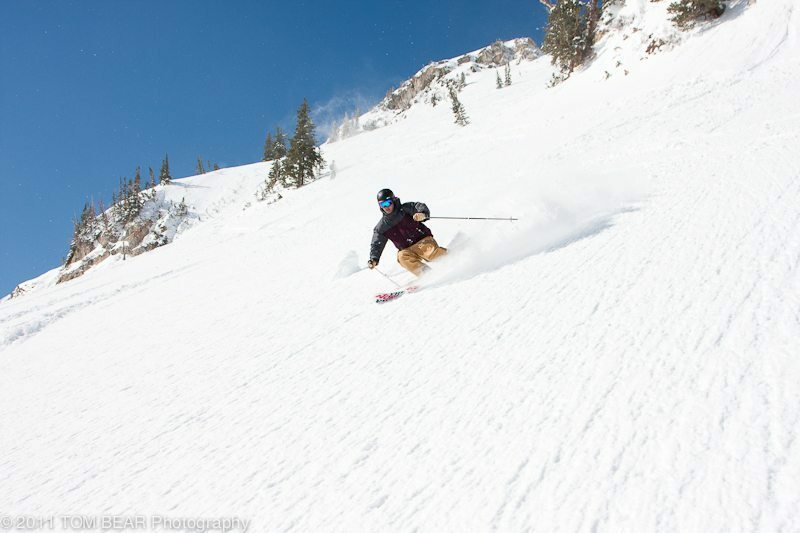 Jonathan Ellsworth, Alta, on the tip rockered Nordica Girish (110mm underfoot). (1) In many conditions, fatter, rockered skis are easier to ski than conventionally shaped, skinnier skis (think waist widths of 65-85mm). This fact leads directly to the second point. 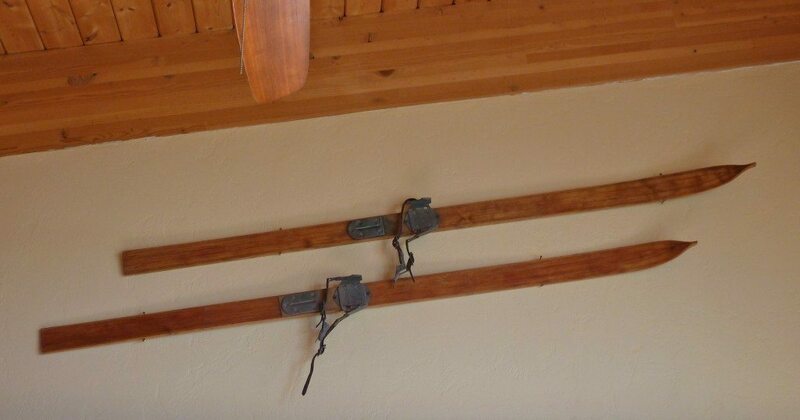 (2) These skis are easier to ski because they are easier to control, and improved control means safer skiing. Skinny skis certainly have their place, it’s just that this place is primarily in the Olympic games, for skiers wearing those skin tight body suits. They also look gorgeous on walls. The problem, however, is that while these skis work well for their designated purposes – mogul runs and groomers – they often become terrible tools when used for other applications, like skiing powder, tracked powder, or chopped up heavy crud. Las Leñas after a 5 day storm: not the time to have toothpicks attached to your feet. Skinny skis sink. Since they lack the surface area to float and to allow the tips to rise above or near the top of the snow, the skier is left with one of two options: ski fast, or ski in the backseat. lovely website: very nice on the eyes (font, structure, pics)…hope it goes your way. question: what powder ski would you suggest for my skiing style…need one to add to my quiver; considering the atomic automatic (but their min size is 180 and i’m only 168 tall/5’6″), blizzard conchise or gunsmoke. my style is neither finesse nor aggressive strictly; it varies on how i’m feeling that day….i have been rated an advanced intermediate skier…..so some ski in the 110-120mm waist range, perhaps, is what i’;m seeking: that is versatile: can handle crud, deeper pow and even ok on groomers. Thanks for the kind words about the site, Canali. I think the Cochise or the Automatic would be great choices for you, and I love both skis. The Cochise will be better in firm conditions and at high speed in chop than the Automatic, but the Automatic is definitely better in pow, and handles chop well if you aren’t trying to rage down the mountain. I also wouldn’t worry about the 179cm length in the Automatic – it is an easy, intuitive ski, and I doubt it will be too much for you. 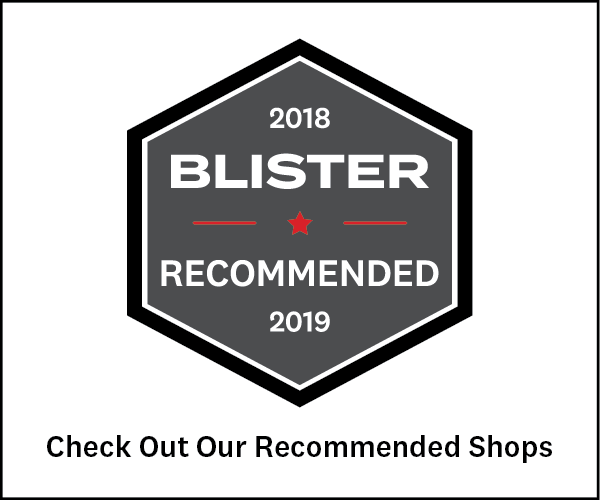 I’d encourage you to go back and read our reviews of both of those skis, and pull the trigger on whichever sounds most appealing. And let us know how it works out for you! thanks for your help…if i can come across last yr’s K2 Obsethed I just might splurge for model and save some cash….have read good things on that model as well. Another great article, Jonathan! I am also a huge fan of your site – it’s awesome! Having owned the 78mm mogul skis you refer to in this article (the Dynastar Troublemakers, I believe?) and used them for EVERYTHING for the last 7 years, I just pulled the trigger on a pair of 182cm Belafontes (a ski I’d never heard of by a company I’d never heard of until I read 4 articles about them on your site) and can’t wait to see how that goes (I debated hard with myself about the Bibby Pro too but thought the Belafonte might be a BIT more versatile – we’ll see how long it takes me to convince myself I need it though). My wife (who has a very technical style and will ski anything that can hold snow) is considering making a similar jump from traditional skis (Dynastar Intuitiv Big) to something rockered / fatter and is having a similar debate as the one I had. She`s looking at the Moment Bellas (a slimmed-down Bibby Pro) but is somewhat torn between those and the Aramada TSTw (strongly recommended for its versatility by a nearby ski shop that also carries the Bella). Wondering if you guys have a view here or if there are any other skis (women specific or otherwise) that you could recommend – any help you can provide would be much appreciated! Thanks and keep the excellent reviews and articles coming! Many thanks, Andrew. And that’s a hell of a jump: from Troublemakers to Belafontes! I’ll be very curious to hear what you think. Bibbys are definitely more fun in deep snow than the Belafontes, but on firm, and in chop and crud, I love the Belafontes…which I guess you already know. Now, as for your wife: 1st, it sounds like you married well! 2nd, none of us have skied the damn TST or the TSTw, and that needs to change. 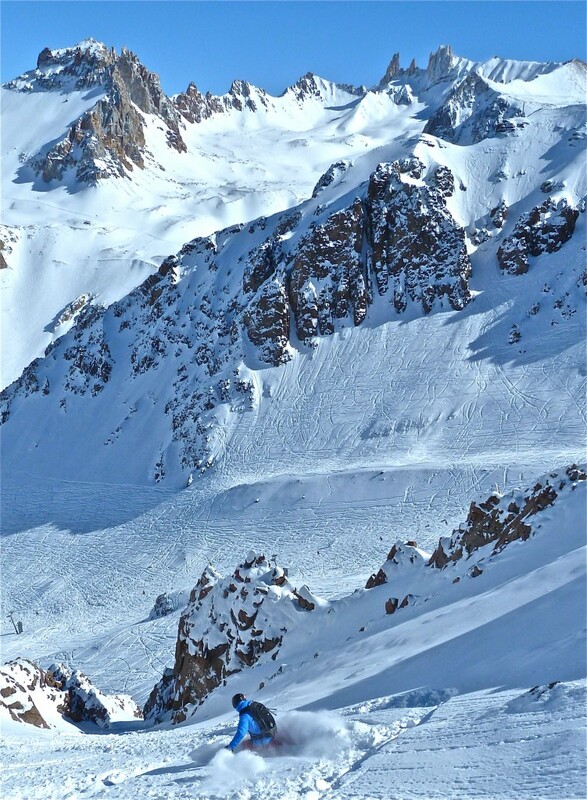 Our guys want to ski it, our girls want to ski it…it needs to happen. We’ve heard good things, but can’t confirm or deny. You’ve already read our 2 reviews of the Bella, but the only other ski I’ll throw in the mix are the Line Pandora and the DPS Yvette (exact same as the DPS Wailer 112RP). Hopefully, we’ll have a TSTw review up if we get more snow soon, but I think the Pandora, 112RP, or Bella will likely be a hit, should your better half choose to go one of those directions. So, having now tried-out the 182 Belafonte (I’m 6’2″ and 200lbs but sized down) in mostly firm conditions at Whistler/Blackcomb over the last couple of weeks, I can say that I’m nothing but pleased. Awesome. I can only compare to the Troublemakers but the ‘fonte is excellent (stable and very supportive) at speed on hard pack and in steep cut-up (and sometimes icy) chutes, in bumps of all kinds (they were getting pretty big by the end of our stay), tight trees… yep, pretty much everything. Compared to the Troublemakers, I found it really easy to throw them on edge and scrub speed whenever I wanted and just cruise through [whatever] the rest of the time. My only beef is that the top sheets chip away / get ratched-up pretty easily (but the skis rule so whatever). I never noticed the additional 30mm (per ski) of width underfoot. We did find some soft snow and they were very good in that but I can’t really speak to their powder performance just yet. Once I’ve had some days in deeper snow, I’ll be able to say definitively if I find myself wanting an extra 5cm of ski from a 187; thing is that the 182 does everything else so well that I doubt I would size-up (I`d probably just go get a more powder oriented ski for those days). My wife thought the 172 Bella turned very well and she loved how light it was when we were searching for powder stashes; unfortunately, it wasn’t really the right ski for the conditions we had (she was often wanting a stiffer ski, especially in stiffer and sun-affected chop). We both think she’ll like them a lot more in fresh pow (we’re back to looking for a daily driver for her in any event). Setting my love of the 182cm Belafontes aside for a “Moment”, I’m very seriously considering adding a pair of Bibby Pros to my quiver to hopefully address the obsession I’ve developed with this ski since starting to read your website (thanks for that, by the way). I’m pretty sure 190cm is the way to go but given how much I like the 182cm Belafontes, I wanted to get your thoughts on whether I should be on the 184cm Bibby Pros instead. I know you’ve covered this ground before, more or less, and don’t want to get in the way of a busy (and excellent) review season so your response doesn’t need to be long or thoughtful (“Go for the 190s.” would be more than adequate), but any thoughts you have here would be appreciated. Hey, Andrew – at 6’2″ 200, get the 190 Bibbys. Ski the Belafontes when it hasn’t snowed, ski the Bibbys when it has. Done. I ski in the alps and as such dont get as many good snow days. I will be in the trees and deeper snow whenever its there to be skied but I am worried that going for a wider ski will substantially compromise performance on groomers. At the moment I’m thinking of going for skis that are around 100mm waist like the line blend or the moment PB&J. Do you think this is the right area to be looking? Hi, Tom. Tip rockered (only) skis that blow my mind on groomers are the Rossignol Experience 98 and the Volkl Mantra – also 98 underfoot. Both are stiff and have plenty of metal, and are effectively fatter race skis. They aren’t super-playful skis, but if you ski very, very hard and fast, they are phenomenal on piste. The tip & tail rockered ski that I am most impressed with to date is the Rossignol Scimitar (98 underfoot). I haven’t skied the Volkl Bridge, but the Bridge & Scimitar are very similar, and you might see our reviews of both skis. The Bridge & Scimitar won’t provide the massive rebound of the Mantra / Experience 98, but they are far more playful, pivoty skis. I love the PB&J, and can’t speak to the LINE Blend. The PB&J is good on groomers, but not in the class of the other skis I’ve mentioned. Where I think the PB&J shines is in cut up chop, and up to 16″ of pow – whether light or heavy. Hope that helps. Nice article, but I dont completely agree on the going faster part on traditional skies. I ski with Blizzard Titans (pretty skinny, traditional camber, no rocker, but twintip) and you definitely do need a decent amount of speed to make them float! This speed is actually perfect for the short rythmic turns in powder (2 to 5 meters between turns) But a one point when you’re really beginning to go fast in powder (making less turns), the tips start to drag/sink again, and I really need to go in the backseat to prevent me being catapulted 10 meters. I don’t know if its my technique?? ?, but I cinsider myself as a expert skier since the ESF (french ski school, one of the best reputations in the world) has asked me to become a teacher for them.. I just think its one of the properties of the ski, at a certain speed the drag forces become to big and pulls the ski into the snow? I don’t disagree, Kevin. I was approaching the issue more from the angle of the beginner / intermediate skier struggling at slow speeds in pow. You’re right that at a certain point, skinny skis will tank – it’s one of the reasons why you didn’t see a whole lot of straightlining back in the days before fat skis. And I hope you enjoy those Squad 7s! Be sure to let us know what you think. Hi Jonathan I am reader from Grece quite far from all you guys. I envy the places you have and are jealous of you for the mountains you have. I have been mostly skiing groomed tracks and trying to get as good,as possible in carving. I’d like to try some powder but I would really be a beginner there. I am quite have 93kg and 190cm. From what I read from your excellent site I was considering of line influence 115. Dps wailer 112, skilogik powderball and atomic automatic I have a ski I use for groomed a. Volkl tigershark 10ft. What would you suggest for me?